DENTROCASA 2018 is a show dedicated to furniture and design, interior finishes, floors, doors, windows and outdoor, conceived, designed and organized by PRINCIPEMEDIA, is preparing to celebrate its sixth edition, which will be hosted again at Brixia Forum- Brescia Exhibition Center, via Caprera. DENTROCASA EXPO embraces the concept of “DENTROCASA” inside-home magazine from which it draws its name. It stands out for the care of the show, the level of products, and the wealth of events and workshops with professional upgrades, information and entertainment. A great novelty of this edition is the presence of three thematic areas realized within the exhibition path: DENTROCASA FINE ART, a section dedicated to quality art and antiques in collaboration with leading professionals of the sector and with Confcommercio. DENTROCASA ECO, an area dedicated to the world of ecosostenibility, energy efficiency, thermal insulation and living comfort. DENTROCASA REAL ESTATE, exclusive show room for real estate proposals and technical sector consulting and showcase for construction companies and administrators of condominium. 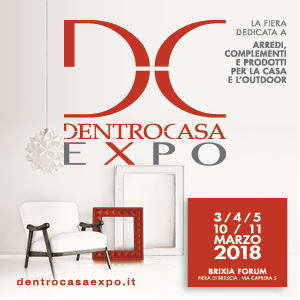 The Exposition is also open on Monday 5th March 2018, in order to meet the needs of the operators of the sector, DENTROCASA EXPO touches all the dimensions of living, for comfort and class choices to match your lifestyle. Objective: open new horizons on the front of the quality exhibition proposal in line with the most current communication strategies. Unchanged Target: visitors and enthusiasts interested in buying and professionals operators of the sector.